Facebook has acknowledged the ways journalists use the service by actually creating a department that specifically works with journalists. They hired Vadim Lavrusik as the Journalism Program Manager. 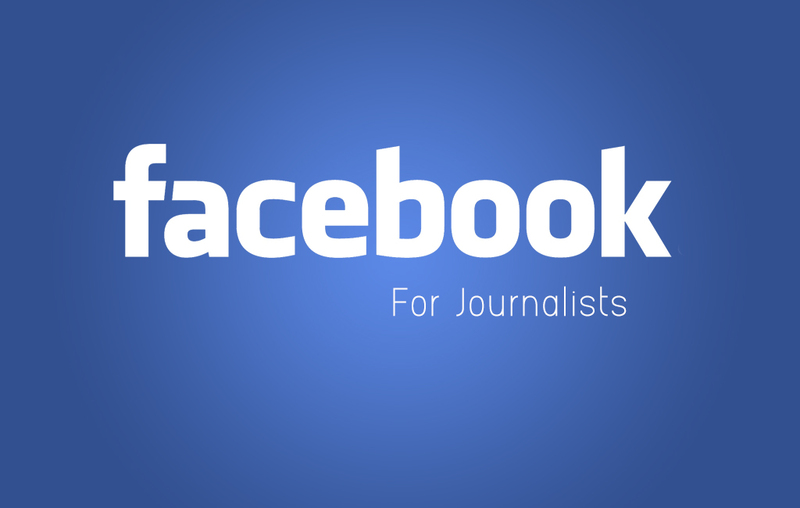 This page shares a lot of great info and advice for journalists using Facebook including a number of handy guides to Elections Coverage, getting started as a journalist on Facebook and notes on ongoing projects and case studies. The page regularly shares useful links and commentary on what’s going on in journalism and links to journalism studies. If you’ve ever wondered what good is Facebook beyond keeping up with the mundane status updates of high school classmates and a steady stream of game invites, this page may renew your faith in the value of Facebook. 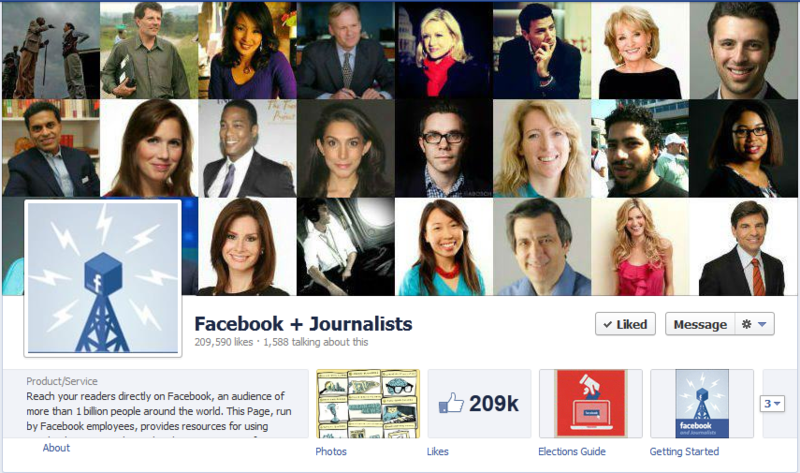 Facebook has collected great examples of how people are using Facebook in meaningful ways. For example, this past election, many people announced on Facebook when they had voted. In turn, Facebook mapped that data creating a real time map of people voting around the country. This page is meant for businesses, but managing a newsroom or your personal brand is a full time job. This page gives tips on how to best leverage your presence to attract attention to the information you are sharing. Aside from using Facebook to push out information, it’s a network of millions of people that you can work with to get information. However, finding the people you need can be one of the trickiest parts. 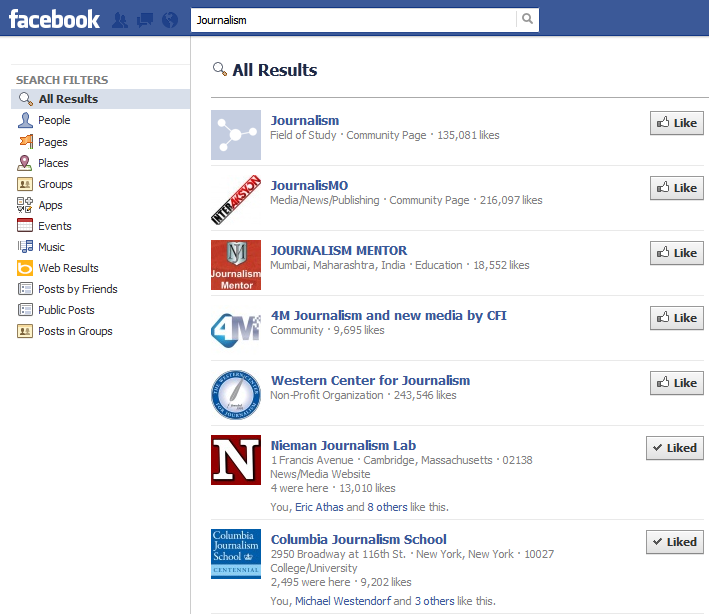 Facebook search helps you search any public posts or information that has been posted by someone. It take a little practice to get used to especially since most of us are so used to the Google style interface. It’s easy to slip up and share a personal post you might not want the public invited in on. People will like a page without much thought. It’s an easy action. Overall the best combination is to use a page for your organization or publication and use your personal profile with the Subscribe feature for yourself. Alaska Media Lab has a Facebook page, whereas I’ve opted the profile/subscribe route. You can find me here. 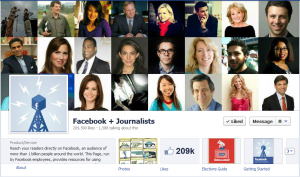 In Sept. 2011, Facebook introduced the subscribe feature for personal profiles. This feature allows people to view your public posts without being your Facebook friend. For journalists, this has become a very valuable tool by letting journalists interact with their followers with more ease. This has also helped resolve any lingering indecision between making a professional page or using a personal profile. A profile with appropriately picked privacy settings teamed with using subscribe is more than adequate for any journalist wanting to interact with their audience on Facebook. Just today, Facebook announced that Subscribe is going to become Follow, in a move that many say nods to Twitter terminology. However, Follow is a little clearer as to what the feature actually is. If someone isn’t your friend, they can still follow your posts if you enable it. 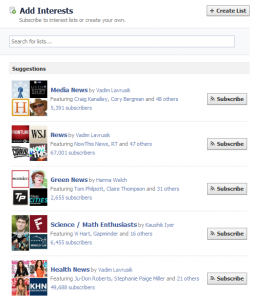 Around the time that the new Timeline design was rolled out, Facebook also introduced Interests, which allows you to subscribe to the updates of a lot of pages or people very quickly. Facebook already has plenty of premade interest lists for just about every topic you can think of. If they don’t have one that works for you, it only takes the click of a button to make your own, which you can also share with your followers. One great way of using this feature is to make an interest list for your beat. For example, I have an interest list that includes the updates for Alaska Media outlets that have facebook pages, another for local groups and businesses, Alaska government officials, etc. They are a great way to quickly get a sense of what a group is talking about at any given time. 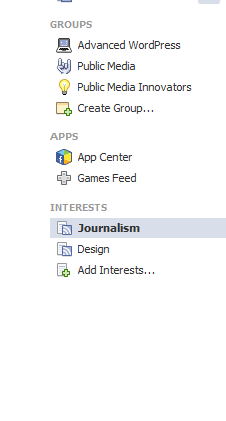 When you are on your profile looking at your news feed, Interests should be listed on the left side in one of the menus there. One of the most important things to talk about is privacy settings. While it’s not the funnest thing in the world to, go through your settings one at a time and make sure that things are set to be visible only to the people/groups you want them to be. Doing this will save you a lot of time later and possibly some embarrassment. Make using Facebook as worry free as you can and pick the right settings for what you are comfortable with.